Garage door off track, if not stopped immediately could turn into a serious issue that will require much more funds to be fixed. The most important step is to stop its operation as soon as something goes wrong to avoid damage to the panel. Panel replacement will be necessary otherwise. It is even possible to avoid any damage if the door is caught in the process of coming off the track. In this case, it can be easily reattached to operate as normal. Although, in this case calling a professional for the checkup would still be a wise decision. 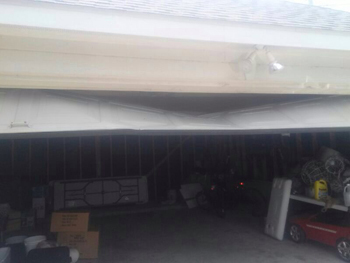 If you see that the garage door isn't moving both sides simultaneously or is moving slower than usual, there is a good chance it is off the track. In this situation, you need to separate the garage door opener from the door by pulling the special handle that disengages it. After this, it is safe to call the specialists without worrying that anything worse might happen. Fixing this particular problem is done by the realignment of the door on the tracks. It happens by raising one side of the door until it is back to its original position and adjusting the other side afterwards accordingly. Before the second side is readjusted, tracks are usually checked for any damage or bends they might have sustained. If even one of the tracks is bent in some way, the door will come off again the next time you operate it, so you need to get that track fixed first. Finally, the opening and closing is checked several times in order to ensure that the problem is fully solved.